Counted as one of the main festival of Hindu, Dashain is the festival of good against evil. According to our calendar, 19th October 2018 (2nd of Kartik 2075) is declared as Bijaya Dashami day, where we put tika from our elders and get blessings from them. We have consulted to some astrologist and religious people and came to know that the suitable time to put tika in Dashain 2075 will be 9:51 am . Some also pointed that , there are two suitable times for putting tika in Dashain 2075, one is at the morning at 7-11:am and at the noontime 12:00 pm – 3 :00 pm. One can schedule their time accordingly. This years Dashain is quite beforehand than usual,its nearly a month earlier than the last years dashain. In Nepali Roman: Yo saal ko Dashain ko tika ko saait bihana 9:51 ma raheko cha. 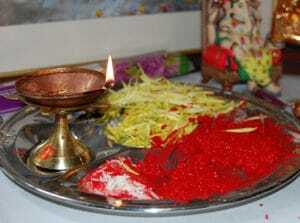 Many Nepalese people also put tika till the 5 days of the Dashami i.e. till Poornima. But there is tradition of putting tika after Poornima as well. For that, the Tika prepared on the day of Poornima will be used further. So, this is good for those who esp. cannot make it through the 5 days of Dashain time. Dashain (Nepali: दशैँ Daśãi, or Baḍādaśãi बडादशैँ), also Bijayā Daśamī (Newari: विजय दशमी), or Mwohni (Newari: मोह्नी), or Durga Puja (Maithili : दुर्गा पुजा) is a fifteen-day-long national festival of Nepal, the Indian hill states of Sikkim, Assam and Darjeeling district and among the Lhotshampa of Bhutan and the Burmese Gurkhas of Myanmar. It is the longest and the most auspicious festival in the Bikram Sambat annual calendar, celebrated by Nepalese people, along with their diaspora throughout the globe. It is the longest and most anticipated festival in Nepal, Bhutan, Burma and North Indian hills. People return from all parts of the world, as well as different parts of the country, to celebrate together. All government offices, educational institutions and other offices remain closed during the festival period.The festival falls in September or October, starting from the shukla paksha (bright lunar fortnight) of the month of Ashvin and ending on purnima, the full moon. Among the fifteen days on which it is celebrated, the most important days are the first, seventh, eighth, ninth and the tenth. Among the Newars of the Kathmandu Valley, Dashain is celebrated as the most important festival of the calendar year. Among th Hindus and Buddhist Newars, it is celebrated with slight differences and interpretations, where each nine days Navaratri (Newari: नवरात्री) leading up to the 10th day called ‘Dashami’ carry special importance. The goddess Durga and her various manifestations are especially worshiped by Hindu Newars throughout the Shaktipeeths of Kathmandu Valley. Among Newars, Mwohni is also important for its emphasis on family gatherings as well as on a renewal of community ties, highlighted by special family dinners called Nakhtyā (Newari: नख्त्या) and various community processions of deities called Jātrā (Newari: जात्रा) throughout the three royal cities of Kathmandu Valley.